I’ve seen the term pop up everywhere lately. In women’s magazines, on popular blog posts and on social media. But what does it mean and why do we need it in our lives? At its core, self care is doing things intentionally that you love. It’s enjoying activities that make your heart sing - whatever that means - but also making taking care of yourself (your WHOLE self) a priority. It is the only way you can take care of others. When my twins were born early, they were in the NICU for nine days. For nine days, I stayed at the hospital around the clock, making sure I was there for every three-hour feeding, every feeding tube change, every single moment. I thought I was doing the right thing but I was not in any way, shape or form taking care of myself. As a result, I couldn’t produce breast milk, I lost weight rapidly and I was SO incredibly stressed and fragile. I was anxious, grumpy and couldn’t sleep. So I know we all are busy. We all have limited time in the day and limited resources - but you MUST make yourself a priority. That can look like a lot of things that soothes your mind, body and spirit (much like the example above in Holly’s quote). Buy fresh flowers and take the time to smell them! When someone sees you are visibly overwhelmed and asks how they can help, give them an assignment. Ask them to run an errand for you, do a load of laundry or pick up some groceries that you haven’t had time to get off your to do list. And when you are in a position to offer help to someone else, ask them how you can assist. 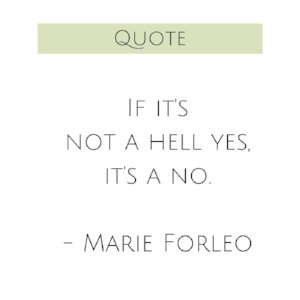 If it’s not a hell yes, it’s a no? Life is too short to waste your precious time going to the progressive dinner with neighbors you can’t stand, attending a church retreat with friends who no longer inspire you or volunteering at the school just because you think you have to do that to get a gold star. Throw out the idea that you don’t have the time or resources to carve in some “me time” into your day and identify some little things you can enjoy to keep your shiny goblet full of self care. Say your Daily Mantra "I take care of myself so I can take care of others."